I've done a makeup in film post for Katniss before, back in March 2012, to coincide with the release of the first Hunger Games film, however, that post concentrated more on Jennifer Lawrence, so this time around I really want to focus solely on the character and how much she has changed since that first film came out. 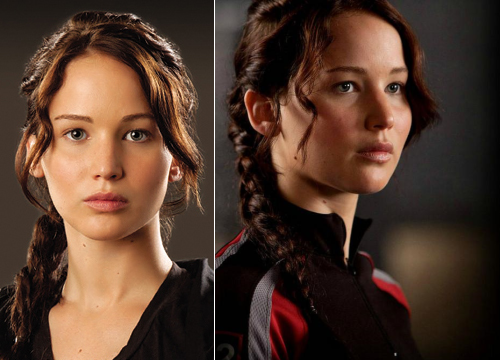 As a character, Katniss isn't someone who you can imagine wears any makeup at all. Looking beautiful just isn't on her list of importance - behind, y'know, staying alive! However, an area that Katniss has completely changed is in regards to everything that she does relating to the Capitol, that has been created (in the film) by Cinna and his team. 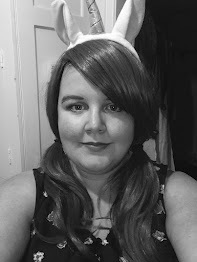 But, it is her Tribute makeup that really plays up that innocence with the soft skin colouring, and eye makeup that makes her eye look large, sweet and perhaps even vulnerable. Even the hair-style - in my opinion - has an air of childlike-ness to it. 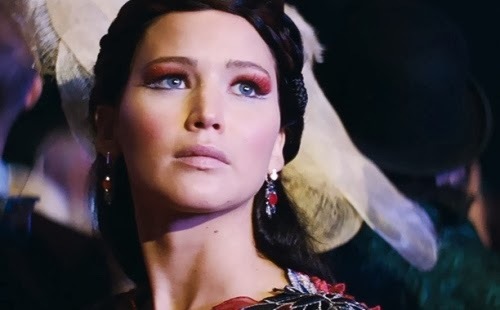 For me, Katniss' Tribute Parade makeup - and outfit - are incredibly revealing of her growth as a character, and her growing anger at both the Capitol and - probably most especially - President Snow. 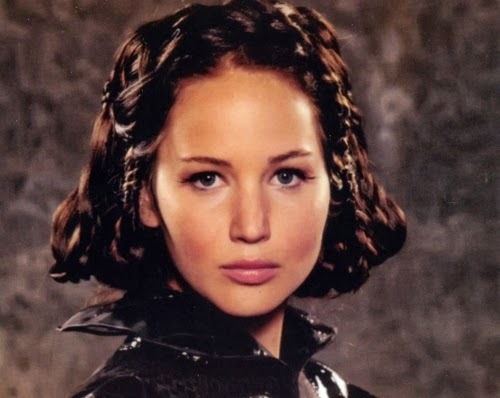 The makeup is very strong, bold and - in my opinion - empowering, and combined with that glare, it feels like Katniss (and Cinna), are staying "You can't control me. I'm not afraid of you any more." For me, her Tribute Parade look is the most important one throughout the film. 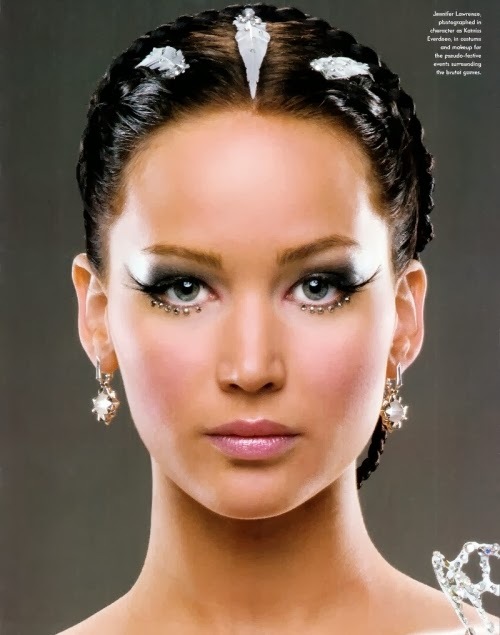 The wing-effect of her eyeliner, looks very much like the wings of a Mockingjay. It is certainly a clever look. I can imagine that the makeup artists have such an amazing time, plotting what looks Katniss could have,because there is so much room for creativity and imagination. It's just such a shame that the team did not receive an Oscar Nomination for their hard work.